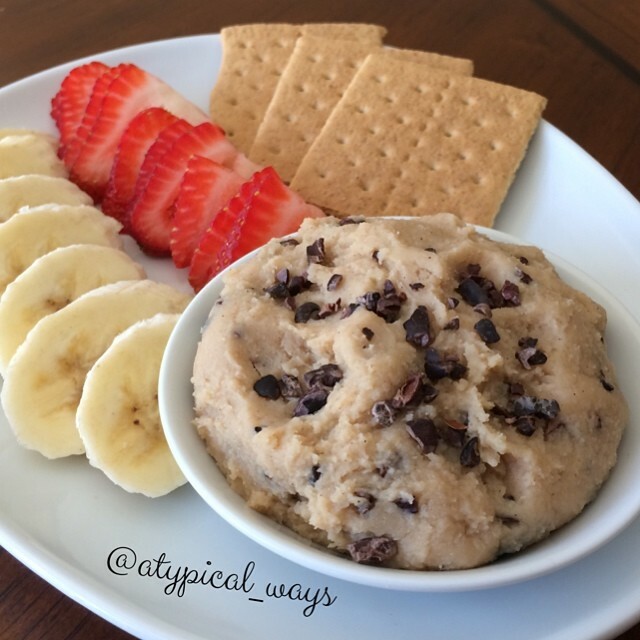 ‘Guilt Free’ Chocolate Chip Cookie Dough PROTEIN Dip! Quick & simple! 1oz TruVibe organics cocao nibs – yum! 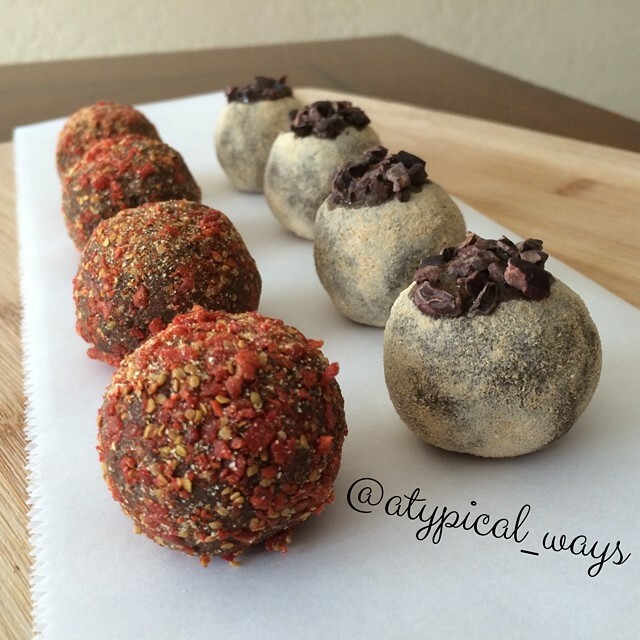 Maca & Goji Chocolate Avocado PROTEIN Truffles! I feel like all I really need to say about these is ‘CHOCOLATE TRUFFLES’, those 2 words alone would have me! But these aren’t just any chocolate truffles….these are Avocado chocolate truffles! I rolled half of them in ground up TruVibe Organics Goji berries and the other half have been rolled in TruVibe Organics Maca powder & then topped with Cocao Nibs, AMAZING! I promise you! Place avocado in a food processor and blend until smooth. Next add in the protein powder and vanilla extract and continue to blend until well mixed. It will be pretty thick & dry at this point. Remove from food processor and place the mixture into a medium sized bowl. Melt the chocolate chips in a microwave safe dish in the microwave for 1-1.5 minutes, stirring every 20 or so seconds. It took me just over a minute in my microwave to melt the chocolate. Pour melted chocolate on top of the avocado mixture and stir until well combined. Cover with plastic wrap and place in refrigerator for at least 4 hours to firm up. Add the goji berries with about 1/2tbsp of flour(to keep from sticking together – I used gluten free oat flour) and blend until a fine powder. Remove dough from the refrigerator and roll into balls of desired size, placing on parchment paper. Add the maca powder & goji powder into two shallow dishes/plates and roll balls into them, using your fingers to smooth all over the outer surface. Take the maca powder balls & dip the very top part into a little agave nectar and then into the cocao nibs. Store in a covered container in the refrigerator. For those of you that know me personally, you know that I am all about taking vitamins and consuming superfoods that are high in antioxidants. I firmly believe in their ability to nourish & heal the body as well as slow down the aging process. I am about to be 34 years old (eek!) and I don’t feel that I look it, granted I may be somewhat biased! I contribute this to what I put into my body (minus the occasional cheats!). Now on to my most recent find! 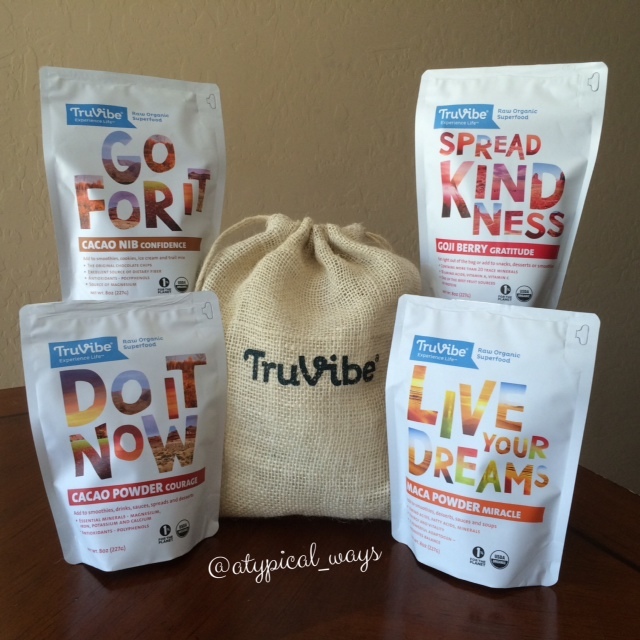 Let me introduce you to TruVibe which is a US based raw & organic superfood company out of Nevada (I love supporting the US economy). I came across them in my search for a new brand of Maca powder & Cocao nibs for some new recipes that I’ve had brewing in my head. Last week I picked up their Maca powder, Goji Berries, Cocao power & Cocao Nibs (they also offer Hemp Seed & Chia Seed). Now let me give you a quick rundown on the products…Superfoods in general have high nutrient density and tend to make you feel good. I have found that they tend to take consistent use for a week or two to really notice the benefits. It’s subtle at first and then if you miss a day you really notice it! I feel like they help my recovery times from working out, partying, and stress. I also notice just general mood elevation after a few days of use. Cacao is raw chocolate and really what’s not to love? Cacao has tons of antioxidants, magnesium and anandamide which is known as the bliss chemical which makes people happy. 80+% of the population is deficient in magnesium and Cacao is one of the best food sources of it. Cacao nibs I add to lots of things…smoothies, on top of coconut ice cream, on top of waffles or in the mix for breakfast, in cookies and sometimes right out of the bag. I tend to find I really like them on top of something else or mixed in something as opposed to right out of the bag. They tend to have a liqueur taste if eaten right out of the bag…hence all the chocolate liqueurs.I find that the liqueur taste completely disappears when added to other foods, even just as a topper. Maca is an adaptogen which is one in every 3500 plants. It means that it helps your body adapt hence the name. It’s adaptogen qualities help balance your hormones and fight stress. Maca is also very well known for increasing both male and female libido. And, lastly but very importantly it is known for increasing energy. The energy kick with maca is very real. You don’t need much of it to feel it. Maca has a very unique taste that is closest to a powdery carmel flavor and can be somewhat of an acquired taste and not to use too much of it til you get used to the taste. It can over power everything and if you don’t like the taste of it you’ll hate whatever you make. Thus, I’d say start slow with Maca and build up. You don’t need a lot of maca to feel the effects and because the flavor can be so powerful like I said start slow and mix it in things that blend down it flavor. Took me a while to get used to it but now it’s one of my favorite superfoods because of the energy boost it provides. It’s really strong and lasts throughout the day. Goji is the anchor point in Chinese Traditional and Tibetan Traditional medicine. Both of those are based around prevention rather than to treat illness like the western cultures. They do have remedies for illness too but they seem to have it figured out with the prevention model from the start. Goji is known to boost your immune system and has a ton of antioxidants. It is also the best fruit source of protein. In terms of taste and use: Goji tastes good and has a sweet taste to start with and a little herb aftertaste. I love eating them right out of the bag and sometimes add them to smoothies or on top of healthy desserts or other breakfast goodies. Like I said, I highly encourage you to check them out if you’re not familiar with them!